With offices and experts on three continents, including global Investment Banking and Private Equity teams, an international equity sales force and a nationally recognized U.S. fixed income platform, Baird offers unique, first-person insights into important markets around the world. This report features insights from C-level industry executives as well as Baird's equity research, investment banking and private equity experts. 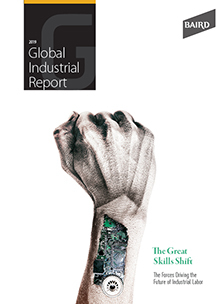 This edition delves into the forces shaping the industrial workforce, including ongoing labor shortages, a widening skills gap and the search for the next generation of workers. Baird Capital’s Industrial Solutions team discusses this growing global market and its compelling investment opportunities. Baird Global Investment Banking discusses the implications for corporate, cross-border and financial sponsor deal activity. Baird Global Investment Banking discusses increased activity from the Committee on Foreign Investment in the U.S. and how dealmakers must adapt.